What a difference a week makes! After the return to summer for last week's Bank Holiday weekend, this weekend couldn't have been more of a contrast. 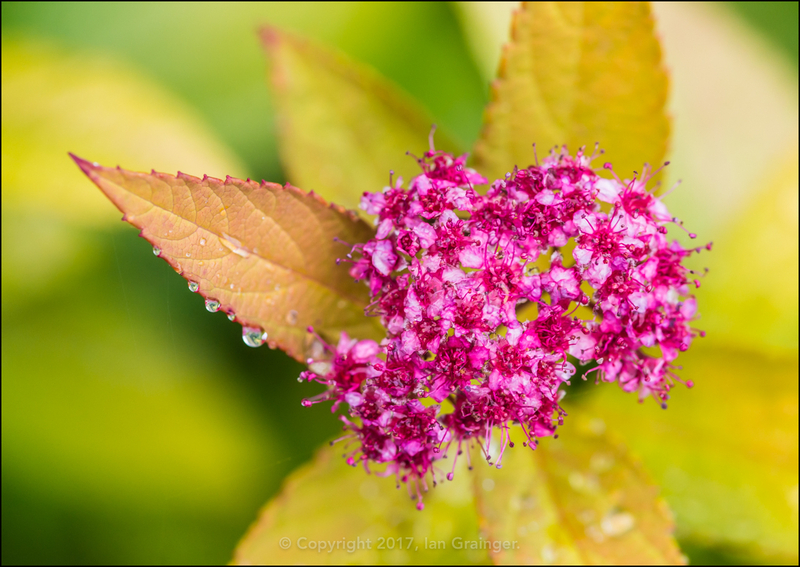 Although the temperature hadn't dropped too much, the blue skies had gone, and the grey clouds that had replaced them were depositing their contents all over my Sunday morning photo shoot. 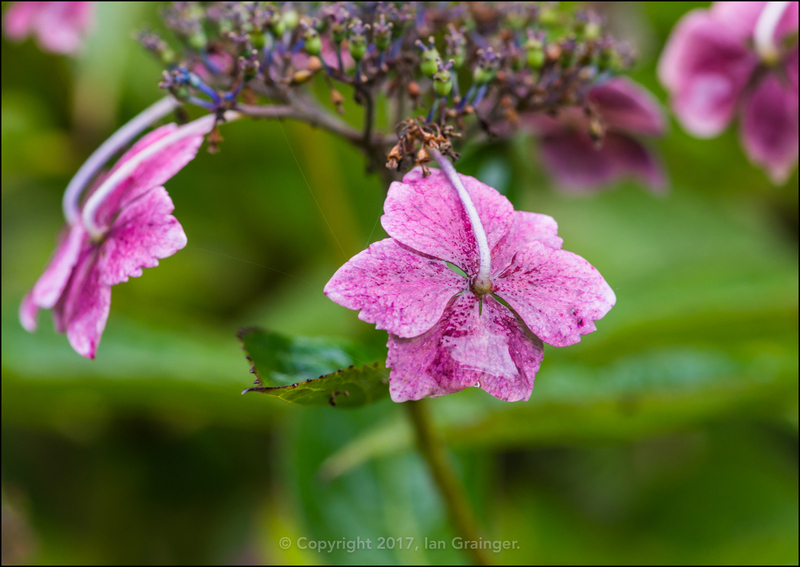 It didn't stop raining for the entirety of my garden wander, but despite getting thoroughly soaked, I tried to capture some colourful images that were in stark contrast to the drab weather. 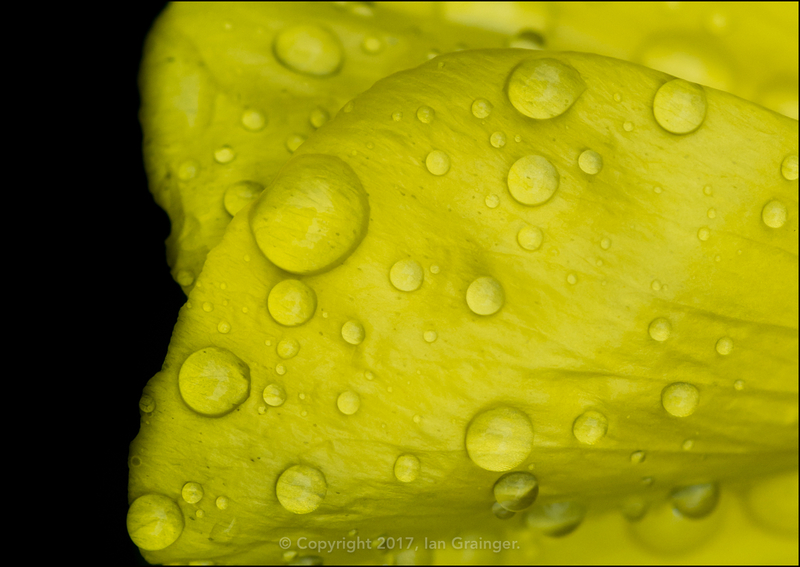 I once again combined my love of abstract and macro photography to grab a shot of the raindrops on this Evening Primrose (Oenothera) petal. 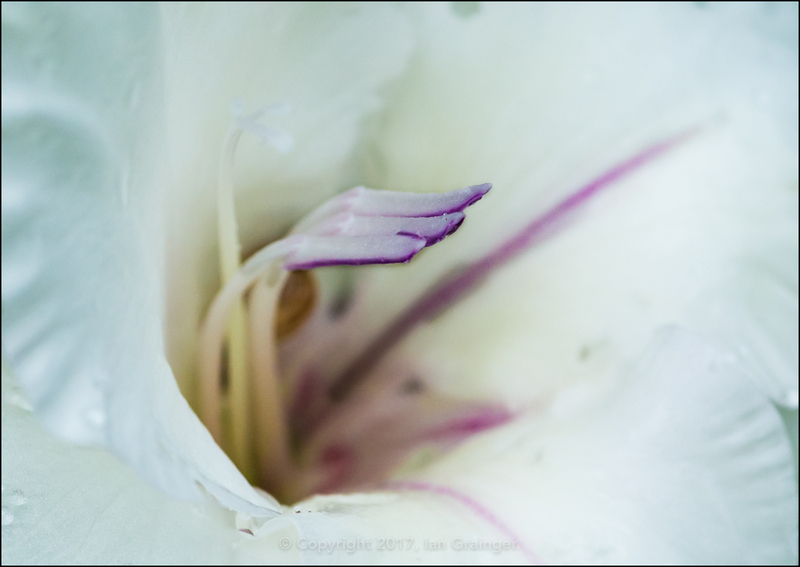 I got in really close to this white Gladiolus bloom to discover that the pollen bearing elements were coloured purple. 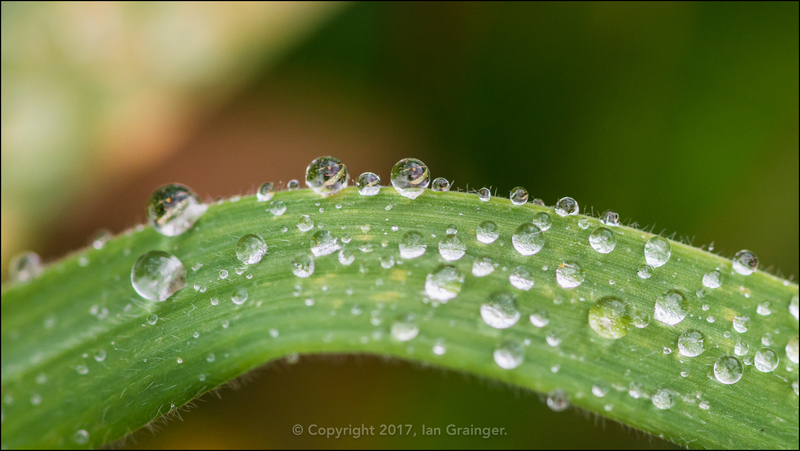 It always fascinates me that small details like this, although obvious when viewed in close-up, cannot be discerned with the naked eye. ...as was this blade of Grass. 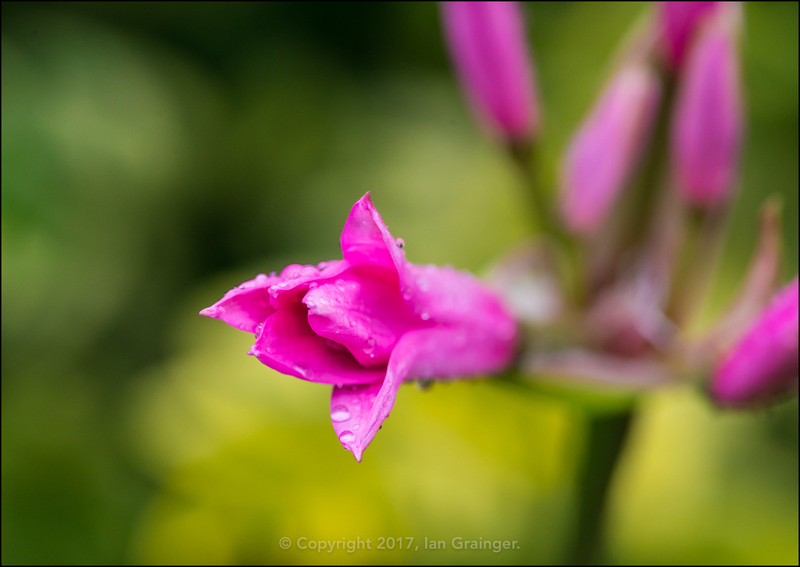 Moving away from the abstract, and into the beautiful, I was astounded to see that the Guernsey Lily (Nerine bowdenii) had opened up its flower bud already. 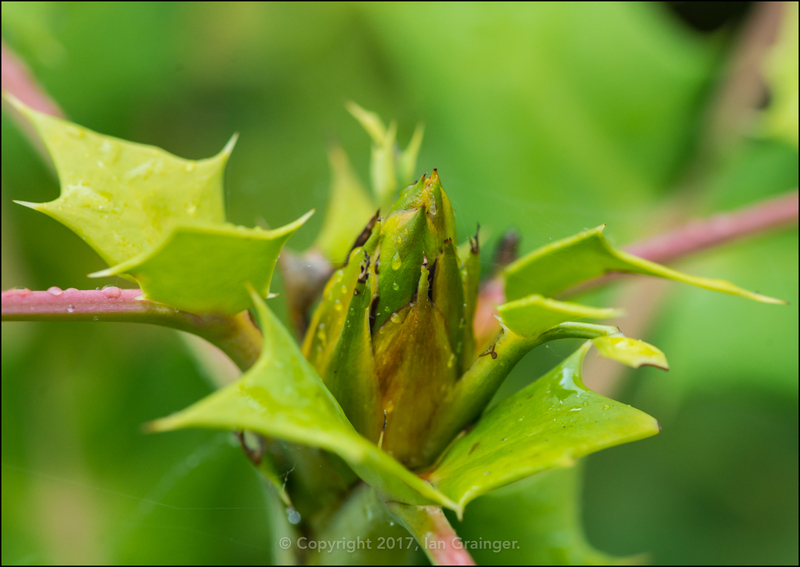 It was only last week that I saw the first bud emerging, and normally it would take until November before the first bloom emerged. Yet here they were already! While my own Dahlias have been a bit of a disaster area this year, my dad's have been fabulous. 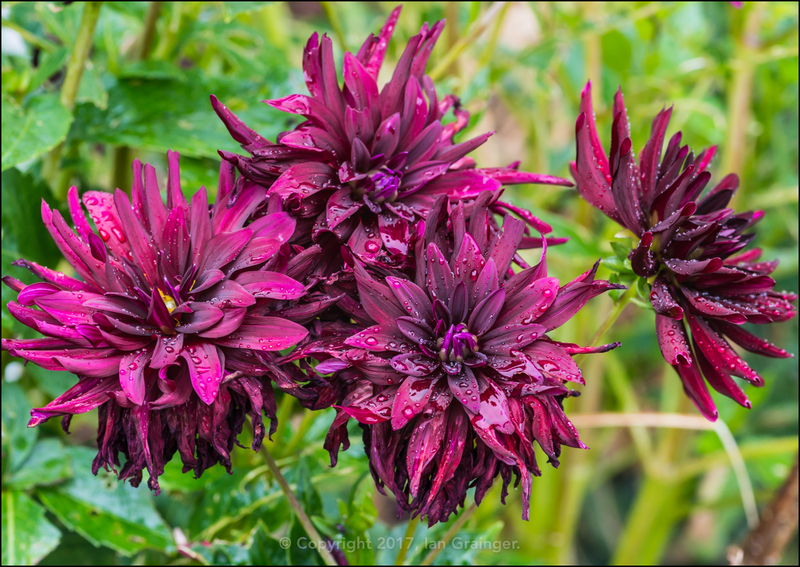 This variety 'Nuit D'Ete' has been covered in flowers, and still has many more buds to open. 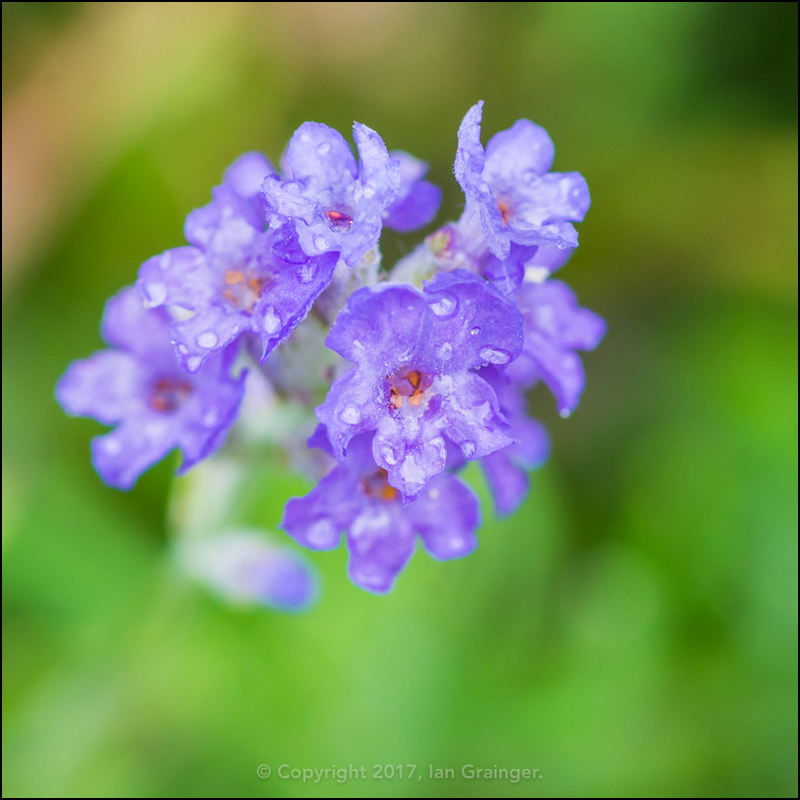 I always think of Lavender (Lavandula) as a plant requiring dry conditions to thrive, but this pretty little clump didn't seem to mind the wet conditions. Every time I see one of these lovely little Herb Robert (Geranium robertianum) blooms I can't help myself from photographing it. I don't know why some people consider them weeds when they're so pretty. 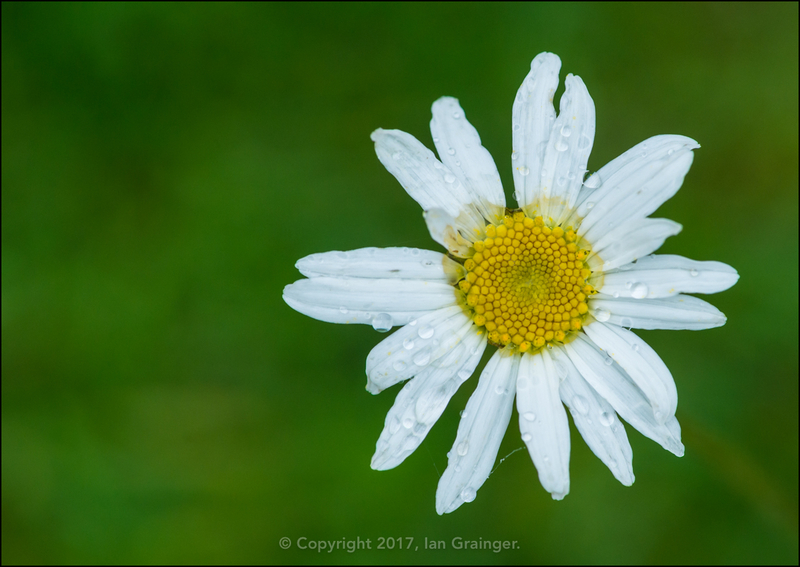 The Oxeye Daisies (Leucanthemum vulgare) were coming to an end, being one of the first flowers to appear in the garden in the middle of Spring. This was one of a few remaining stragglers. 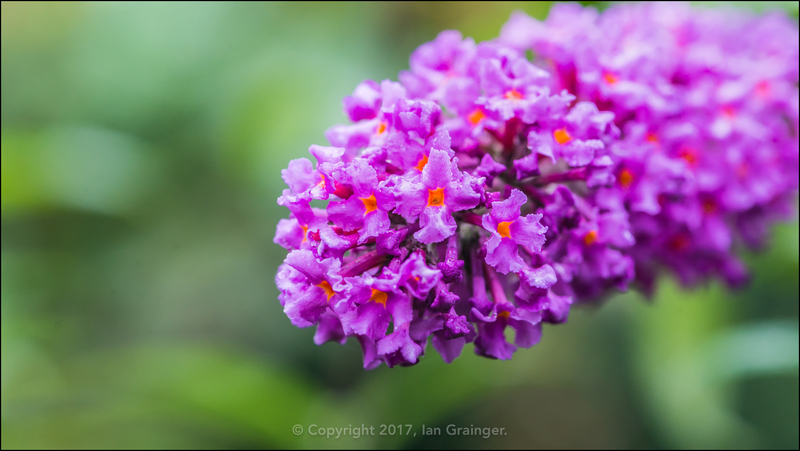 It was raining too hard for any insect visitors to the Verbena bonariensis this week, but it was still looking rather splendid, despite the downpour. 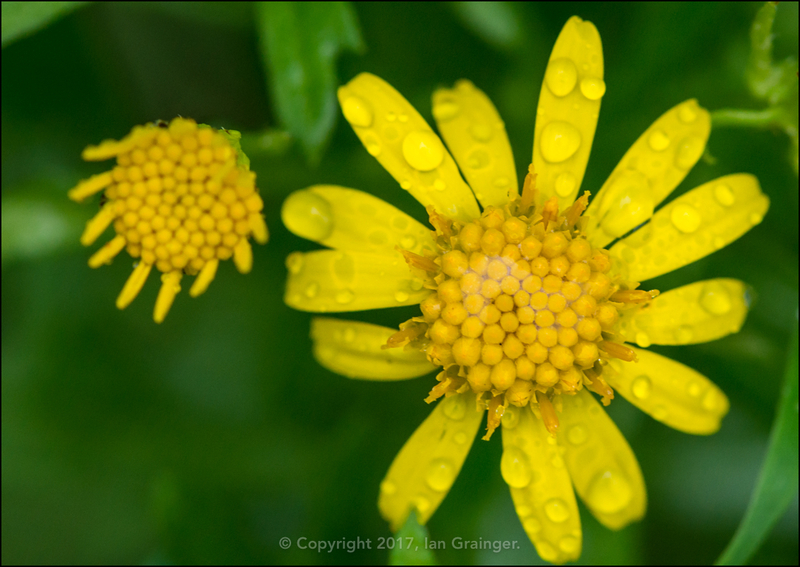 The Ragwort (Senecio) would normally be crawling with Hoverflies if it were dry, but the only thing covering it on my photo shoot were raindrops. ...while the white and yellow flashes of the Feverfew (Tanacetum parthenium) blooms made an interesting contrast beneath them. 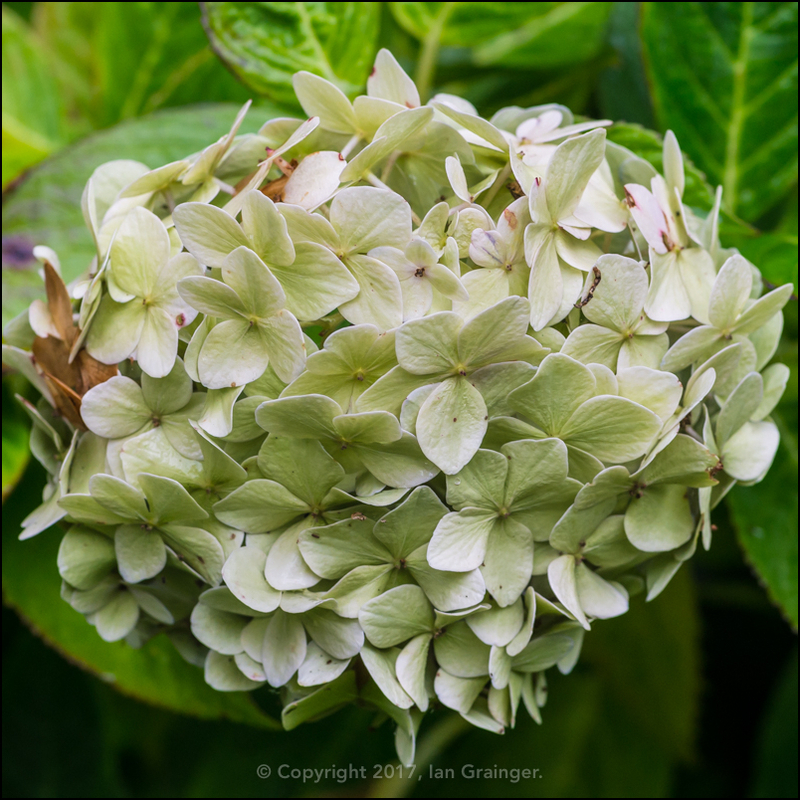 ...and some of the Lacecap Hydrangea Bushes (Hydrangea macrophylla) were regenerating themselves. 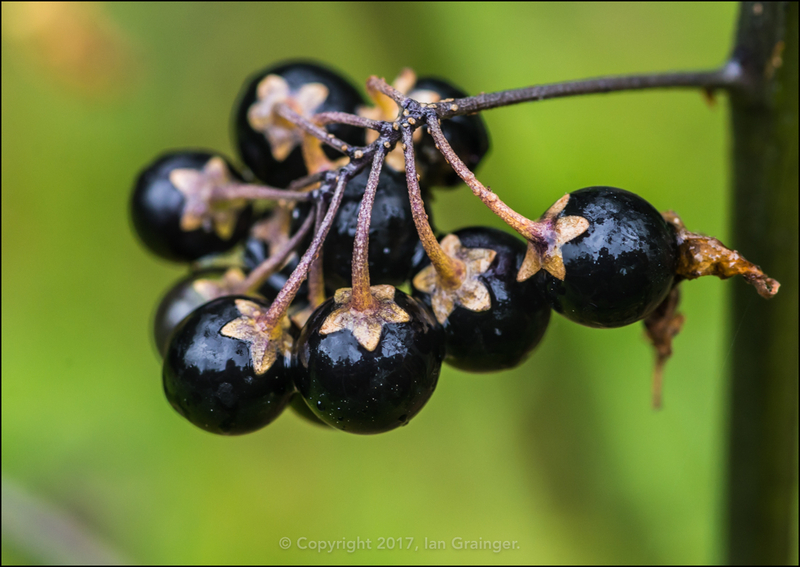 ...and these berries were just about ready to provide the birds with some early Autumn sustenance. 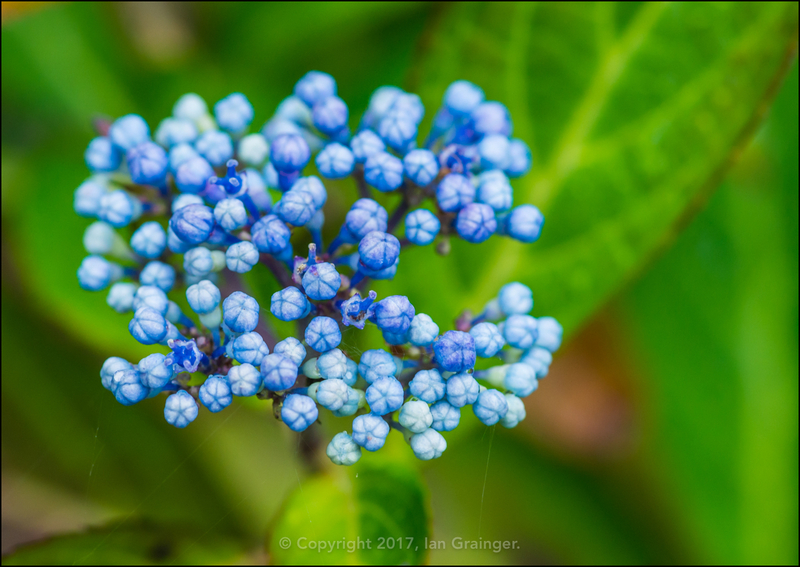 I'm not sure what they are, so drop me a note in the comments if you know! Finally, a fishy friend. 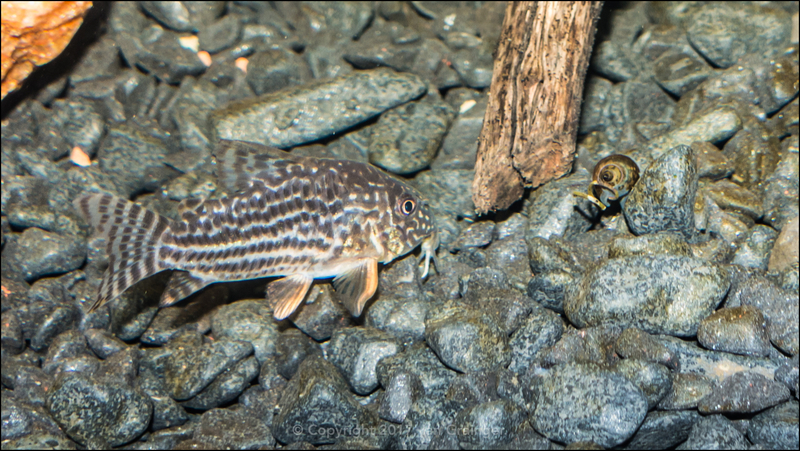 This Sterba Corydoras (Corydoras sterbai) seems to have found himself a new playmate - a Snail! I went to great lengths to quarantine my live plants in an attempt to rid them of snails before placing them into my aquarium. However, the attempt seems to have failed. I fear I'll be picking snails out of this tank forever now.